We are engaged in offering premium quality Asbestos Fiber Gland Packing Rope in the national market. Asbestos Fiber Gland Packing Rope provided by us is a unique inter woven packing rope made using pure graphite fiber owing excellent heat dissipating properties and chemical resistance. We impregnate Asbestos Fiber Gland Packing Rope with superior quality lubricant and graphite in square and round section. Due to low friction bearing surface servicing of moving parts is eliminated. 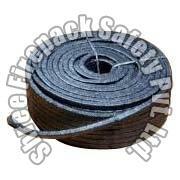 Moreover, our range of Asbestos Fiber Gland Packing Rope can be customized as per clients given requirements.